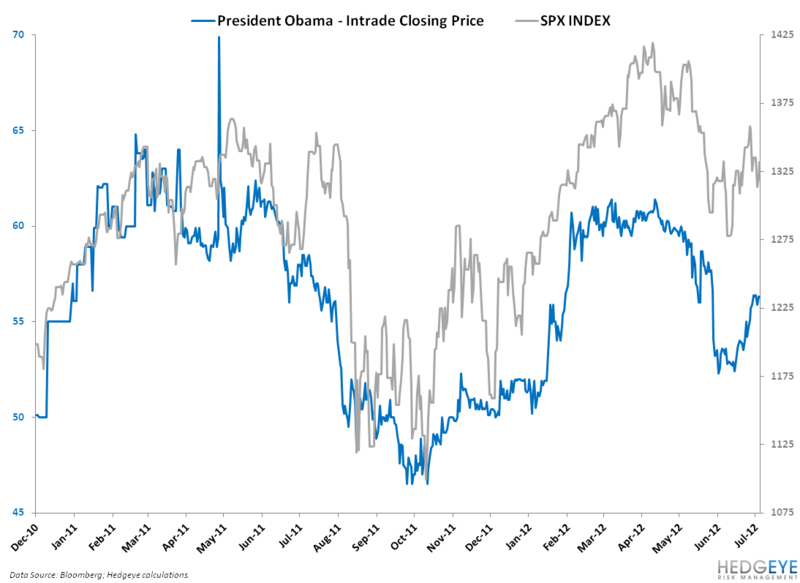 Last summer, Obama’s approval rating on InTrade shot upward from June into about early July. After that, his approval rating fell, caught a slight bounce, and then continued downward. It has yet to recover to 2011 levels. Now that we’ve entered July once again, the same pattern has shown itself. And right now we’re in the middle of the bounce as is the S&P 500, which is highly correlated to Obama’s approval rating. The question remains: will the bounce continue upward into recovery or will it break and send Obama’s rating even lower? It remains to be seen what will happen to the President, but we release our Hedgeye Election Indicator (HEI) every Tuesday. And according to the HEI, the President is just barely hanging on in this fight.